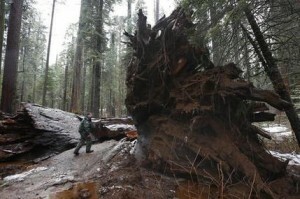 FRESNO, Calif. (AP) — Drenching winter rains combined with the punishing effects of six years of drought are causing trees to topple across California, in some cases with deadly results. At least two people have been killed in the past month. Seemingly sturdy oaks, palm trees in Southern California and giant sequoias farther north have been collapsing. Experts say that in some cases, the dry spell weakened or killed the roots or trunks, and the soggy soil and wind caused the trees to fall over. One woman who struck and killed by a tree while walking on a Northern California golf course Saturday. A woman posing for photographs as part of a wedding party was killed and five others were injured from a falling eucalyptus tree in Southern California last month. Arborist Lisa Smith says that even healthy trees can give way if the ground is soft and their full foliage catches the wind.